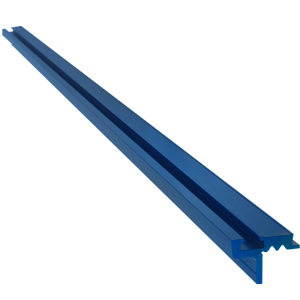 Kreg’s Heavy-Duty Trak is an L-shaped, anodized-aluminum extrusion that is extremely straight and great for heavy-use commercial applications. This Trak contains four T-slots that accommodate the head of a standard 1/4” hex bolt. A 1/2” recessed indentation runs along the top and front side of the Trak for easy application of a self-adhesive measuring tape (sold separately). 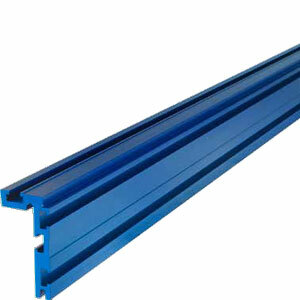 This trak features a self-aligning L-shaped mounting foot for easy installation on a shop-made fence. Just drill 1/8” holes through the back of the extrusion and secure with the included mounting screws. Available in 48” length only. Our Aluminum Mini-T-Track works great for jobs on your work bench, router table, table saw and more. Mini-T-Track is perfect for all your woodworking operations that need a small mounting depth like the face of a fence. With a low profile it can be inlayed into thin material as well as excepting a stansad 1/4" x 20 tpi hex head bolt. The mini-T-Track is designed to fit flush into a standard 3/4" x 3/8" miter slot for all your sliding jigs in your table saw or router table. 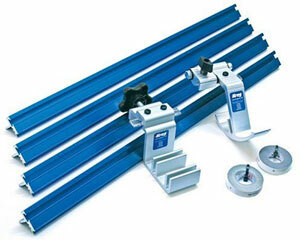 The Heavy Duty T-Track is great for constructing jigs on workbenches, drill press tables & more. The Heavy Duty Aluminum T-Track has a 1/8" wall which will not bow or twist & allows for everday heavy use. No more hunting for hard to find T-Bolts or special locking pieces. Works with 3/8" x16 hex head bolts which can be found at any local hardware store. Perfect for all your ji and fixture needs that require more holding power.